It was a busy little schedule at Wacken 2016 for Michael Kiske and Kai Hansen. Both were involved in the Hansen & Friends project, Kai as the instigator and Miki as guest on a number of songs, which played at the festival and released a live album of their own entitled Thank You Wacken: Live just a couple of weeks before this album was released. 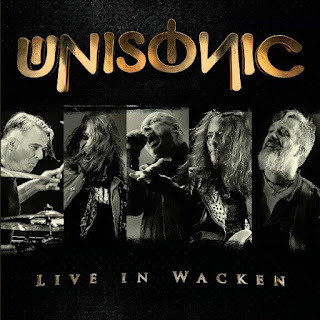 As well as that, then there was Unisonic, the band that Miki sings for and Kai guitars for, who also played on that weekend and which was recorded and packaged for this release, Live in Wacken. It has been quite the journey, most notably for Kiske himself, who had so publicly slagged off heavy metal in the years after his departure from Helloween, and has now come (almost) full circle through the support of his part to play in the Avantasia project and through other friends in Roland Grapow (Masterplan) and Kai Hansen (Gamma Ray). The Unisonic band has progressed from an initial side project for all of the artists to one that has now released two albums and now this live recording, which ultimately goes to prove that the talents of the collective are quite high, and that they can do justice to their material in the live setting. This is a cracking set list. I could not have chosen better if I had been given the job of choosing it. Every one of the best songs from their two albums makes an appearance here, along with the usual mix of older material from the number one vocalist. Opening up with “For the Kingdom” and “Exceptional” from the Light of Dawn album, the band exudes the energy you would expect from such an experienced and talented group. This is followed by “My Sanctuary” and “King For a Day” from the debut album, and both also have that energy you would expect. The joy that is “Your Time Has Come”, where Michi’s amazing vocals soar as well as they ever have, along with the twin guitar solos throughout the middle of the song between Kai and Mandy, and the double time rhythm from both Ward and Zafiriou makes for a terrific live version of this song. Even the slower, less emphatic songs such as “When the Deed is Done” and “Star Rider” still have their moments here, even in their more melodic and less aggressive or fast arrangements. “Throne of the Dawn” is also an improvement on the studio version, and allows Kiske in particular to find a groove for the song that improves it in the live setting. If you ever had any doubts about Miki’s vocal range… well, no… why would you… but my goodness, if you did, then listening to the two Helloween covers here would right that ship immediately. His own “A Little Time” is just perfect here, but it is possibly the interlude in the middle of this song will erase any doubt from your head forever. By incorporating a piece of Judas Priest’s classic “Victim of Changes” in the middle of this song, not only does it fit perfectly musically, but Kiske’s vocals are just magnificent, hitting every note in the lower scale and the upper echelons, as living proof he still has everything in his corner. Then the cover of Kai’s “March of Time”, which still ranks as one of my favourite Helloween songs ever, is just a piercing and harmonic and beautiful throughout. It is a masterpiece. Then album then concludes with “Unisonic” on overdrive, providing the perfect end to what is a sensational live gig and album. It’s a fine line to tread when you have a project like Unisonic, where all the members have obligations in other projects, in order to make it work. Despite the range in music genres between the members of this band, it is terrific to hear it working so well in the live medium, which after all is where it all matters in the long run.